Oakland Police Officer Osborne Lyon was a motorcycle patrolman who was killed in the line of duty. He had been transferred to the Traffic Bureau shortly before his death. In the early Sunday morning hours of August 19, 1931, Lyon was patrolling the streets of East Oakland when he observed a vehicle driving at a high rate of speed. While giving chase, he sideswiped a truck and was thrown to the street, suffering a fractured skull and other injuries. He later died at Highland Hospital. He was survived by his wife Vivian (née Chick) and son William. 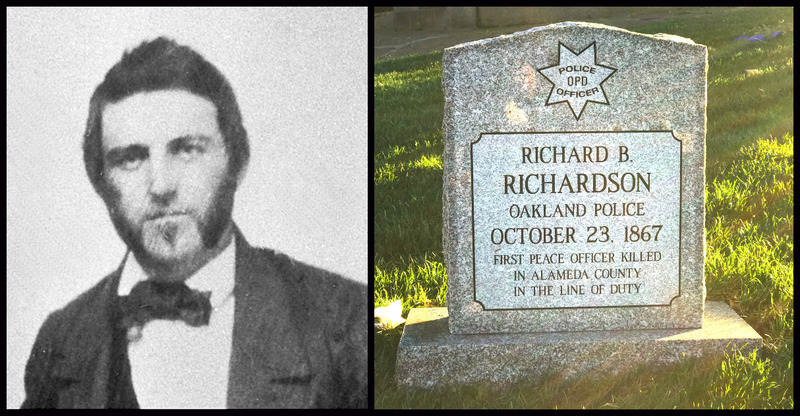 On October 23rd, 1867 Oakland Police Officer Richard Batten Richardson became the first member of the force to die in the line of duty. 150 years later his unmarked grave received a headstone due to the efforts of the Alameda County Heroes Grave Project. The project was organized by a group of Alameda County peace officers who are raising money to honor and place headstones at the unmarked graves of any peace officer killed in the line of duty in Alameda County. Richardson's grave kicked off the effort. Richardson was killed when he went to execute a warrant to John Thomas at a shanty bounded by 9th St, 10th St, Brush and Castro streets in Oakland. Arriving on horseback, he encountered an elderly, nearly blind man who was being evicted from the property, which had been sold. Richardson did not know that the seemingly harmless looking man had murdered two men in El Dorado County and was believed to have a killed a man in Mission Dolores across the San Francisco Bay. When the elderly man's wife refused to allow Officer Richardson entry, he forced his way into the house, and was shot in the neck by Thomas. The bullet severed his artery and hit his spinal cord. Thomas died in jail before being convicted of the crime. Richardson was survived by his wife Mariah and sons Louis and Filaseo.